The bunch of guys Toosh and I paint with are all recovering wargamerholics and I have been spending a lot of time recently coveting their beautifully painted armies. The one thing I struggle to do these days is paint multiple miniatures to a decent standard, but I would definitely like to, but I get a bit bored of batch painting, and find a whole army a daunting prospect. But there is a light at the end of the tunnel – when we were up at the Golem studio there were a number of small personal project around the room which turned out to be a ‘Tale of X Gamers’ type thing. I remember this sort of thing from White Dwarf a few years ago – those involved would start a new army and set monthly targets of a number of points to complete. This number of points always seemed a reasonable amount to tackle and I think the Golem guys had settled on 250pts of a 40K army of their choice. I got my Airbrush out for the first time to lay down the initial colour – a grey gradient – but painted the rest by hand. As a test piece, there are a few things I’d do differently for my actual army. 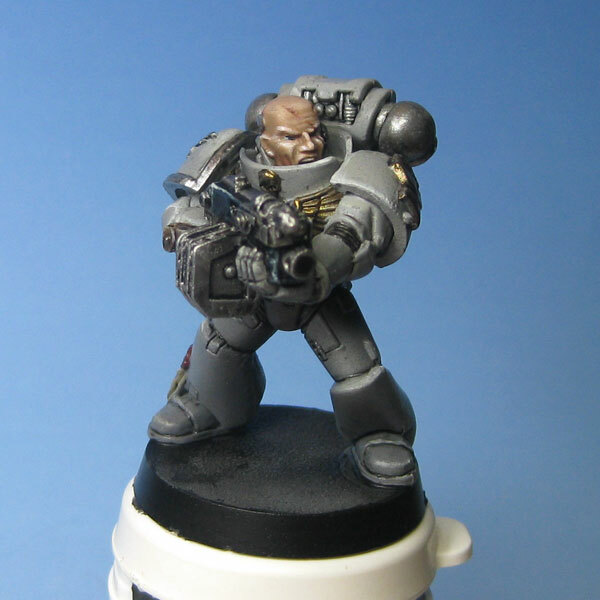 I would leave the head and backpack off, and possibly the gun (although with Grey Knights there are only a handful of models holding guns across their bodies), and I will also be making some more interesting bases for them. They’ll never win an award, but its a start and hopefully should help me learn to paint faster and understand where I can cut corners most efficiently. Great start. Am constantly doing TT level painting for clients, so can attest especially lately that Marines sans Backpack, head and gun makes the process go much quicker. When up to speed, can probably get a marine out in 30-45 minutes to a decent standard. Thankfully you don’t need many to make 250 points! Looking forward to how your Tales of X project goes! Tell that display painter to take one big step back and then see if he looks complete 😉 It’s hard to do, right?